The bad company we hold is only getting worse as estate planning across the generations is continuing to slip. In 2015, USA Today reported that 6 out of 10 Americans did not have a Will. Here we are in 2017, and that number has not really changed much according to Fox Business. However, as we begin to drill into the generational gaps, things begin to look grim. 64% of Generation X do not have a Will. 40% of people 53 and older do not have a Will. It continues to shock me how many people I ask – Why don’t you have a Will? – nearly all state that they either don’t need one or don’t think it is important. 64% of people with minor children do not have a Will. If you have minor children, you cannot use either of those excuses. The absolute least you can do as parents is get a Will to name a guardian for your children. The bad company grows still. 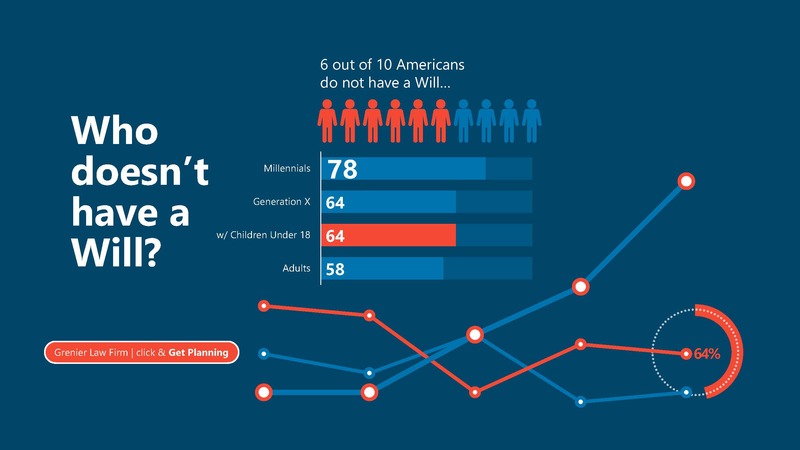 Of the 4 out of 10 adult Americans that did take the time to get a Will, 72% of those people have an outdated Will. Our rule of thumb is a Will should probably be reviewed every 2-3 years. Most people could review their own Wills. Ask yourself three simple questions: (1) Has there been a life changing event? (2) Has there been a legal change? (3) Have your assets changed substantially? I did my own analysis during law school as I prepared to begin practicing law. While the numbers I found were bad, I did not want to admit that the bad company we held was getting worse. The wealth of information and cost-effective solutions out there should make it easy to fix this issue. I began to think to myself: Self, no one wants to spend the money and time to talk to an attorney about their death. Make it easy for them to access legitimate legal advice. So, we did. we created an entire digital experience with licensed local attorneys for our clients to complete the entire estate planning process on the couch, at the ball park, or wherever you have access to the web. Of those that have taken the precious 10 minutes of their time to begin the process, satisfaction is stellar. I still believe that for most Americans that do not have a Will, a digital solution can meet the need. The issue remains; people continue to procrastinate and fall into the apathetic mindset concerning the future, inevitable, truth that we all will suffer the same fate. Let us help guide you through a proper plan. Call us at 877-622-5840. Or click here to visit our digital solution.